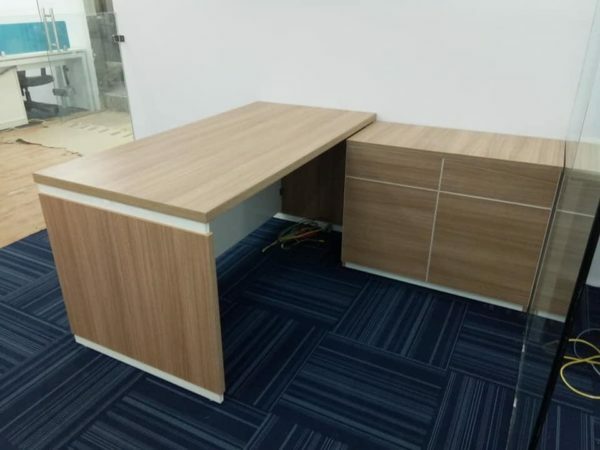 Category: MANAGER TABLES	Tags: "manager cabin table", "manager table for office", "manager table for sale", "manager table in noida", "manager table", "table for manager", manager table design"
This office manager table is visually light and follow minimalist principles of design which are influenced by architectural concepts like the cantilever. Modern furnishings fits best in open floor plans with clean lines that thrive within the absence of muddle. It provides a perfect blend of two colours and is best for office work. Comes with lockable storage drawers to give your work the safety it deserves. We wish to introduce ourselves as the leading manufacturer for office furniture & revolving chairs Our company is a well-established organization engaged in manufacturing of premium quality of office furniture for various applications like office use, cafeteria , waiting area, etc..